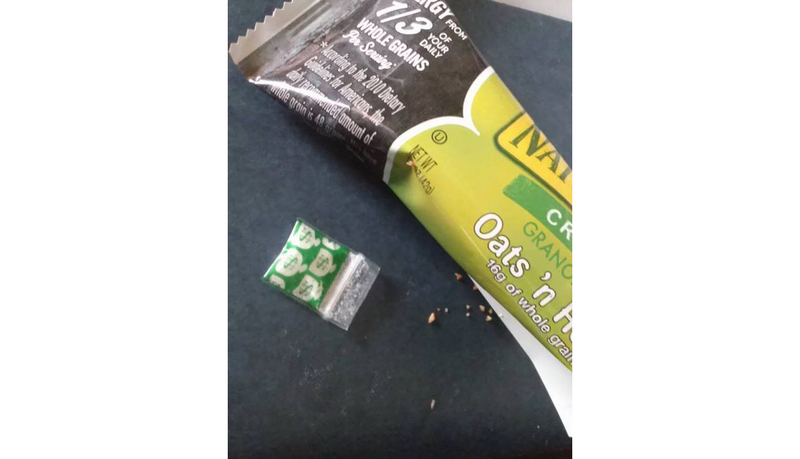 SAN ANTONIO -- A Texas woman recently found more than the usual pick-me-up when she unwrapped a Nature Valley granola bar -- she found cocaine. It happened March 18, according to CBS affiliate KENS. Cynthia Rodriguez of San Antonio said she originally thought she won a prize when she saw the small green baggie with dollar signs on its exterior. She called Nature Valley, and a company representative told her to report the incident to her local police department. Rodriguez said a San Antonio Police Department officer and a detective first tested the substance to see if it was heroin. "(Then) he tried for cocaine and they both looked at each other and he goes 'oh my goodness, its high quality cocaine,'" said Rodriguez, who added that she's thankful one of her 11 grandchildren, three of whom live at her home, did not find the bag first. "What if they thought it was sugar?," she asked. Police are now trying to figure out how the cocaine ended up packaged with the snack. "It's a somewhat disturbing case," Sgt. Javier Salazar told KENS. "You think of a child getting a hold of a package that's got interesting symbols on it, dollar signs in this case, and ingesting something like cocaine that could have a possibly dangerous effect, maybe even deadly on a child." Salazar said detectives are trying to determine when the cocaine got inside the wrapper. "We're not sure if this was something added on purpose or if it was something that may have fallen out of someone's pocket on the assembly line," said Salazar. General Mills, the company that owns the Nature Valley brand, denied responsibility in a statement released Wednesday to the CBS affiliate. "We referred this to the police department in March, and are confident this did not happen in our facility," the company said. When pressed for answers about why company officials feel this way, spokesperson Mike Siemienas said granola bars move quickly along its factory assembly lines and that it would be "difficult" for someone to place drugs inside a wrapper. Rodriguez said General Mills gave her several free boxes of Nature Valley bars as well as several other snack products.